The same Basil Butter with Garlic spread that I love to slather on vegetables makes a delicious filling for Semolina Bread. The flavor of the dough develops best when it is refrigerated overnight before shaping and baking. It also gives you more flexibility in the timing of the bake! In a large mixing bowl or the bowl of a heavy-duty stand mixer, combine the semolina, instant yeast, and salt. Add the water and 1 tablespoon of the olive oil. Mix until well-combined. Gradually add in enough of the bread flour until a soft dough is formed, not too sticky, but just so it barely clings to your finger when touched. Knead until dough is elastic and passes the windowpane test. (Pinch off a small piece and try to stretch it out into a sheet. When the dough is ready it should not tear easily, but you should be able to stretch it out until you can see through it.) Kneading will take 10 to 15 minutes by hand or 7 to 10 minutes with a machine and dough hook. Place in a container large enough for the dough to triple in size. Pour the remaining olive oil over the top and turn the dough over to coat it well. Cover tightly and let rise at room temperature until it doubles in size, 1 1/2 to 2 hours. Turn the dough out onto a floured board or countertop. Fold the top down, bottom up and then each side in overlapping each other in the center. Turn the whole thing over and put it back in the rising container. Brush lightly with oil or spray with oil spray; cover tightly and refrigerate overnight or at least several hours. Remove from refrigerator and let sit, still covered, at room temperature for 1 to 2 hours so it can warm up a bit. Turn out onto a floured board and divide into three equal pieces. Cover and let rest 15 to 20 minutes. Gently flatten or roll each piece into an oval about 10 inches long and 5 to 6 inches wide. Try not to press all of the air bubbles out while you're doing this. Spread each oval with one heaping tablespoon of the Basil Butter with Garlic filling, leaving a small margin at the ends and the top edge. Roll the dough up and away from you, pinching and sealing the ends and seam so no filling will escape. 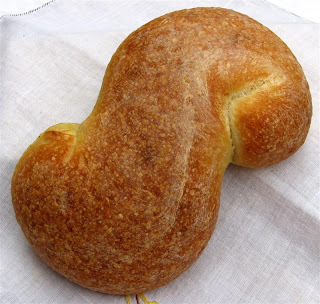 Place your hands on top of each other on the center of the loaf and gently roll and stretch it out until it is about 12 inches long, moving your hands apart and toward each end as you roll. 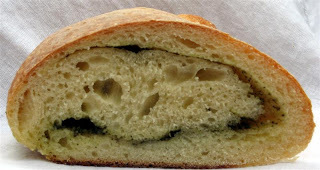 Semolina bread is often made into an "S" shape. To do this, curl each end, in opposite directions, toward the center of the loaf, pressing against the sides lightly to seal. Place the loaves on a parchment-lined half-sheet pan (cookie sheet with sides.) Two loaves will fit at an angle on one pan. Cover the loaves with plastic wrap and let proof at room temperature until doubled in size, about 45-60 minutes. Meanwhile, preheat the oven to 425 degrees with a baking stone on the center rack if you have one. Place the loaves in the oven and spray the oven with water ( a plant sprayer works well). Spray again after five minutes. Reduce heat to 375 and bake for a total of about 25 to 35 minutes, until nicely browned. Cool on a wire rack before slicing. If you absolutely can't wait you can use an electric knife, but anything else will squash the warm loaves.